If you’ve leveled a character from level 1 to level 85, then you know how time consuming it is, but there is a new way to level characters that is taking some of the time out of it. 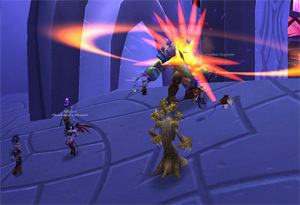 Dungeon leveling involves using the dungeon finder to find groups and simply run instances instead of doing solo quests. Of course you never get to see the traditional parts of the game that new players once spent a lot of time in, but dungeon leveling has made leveling characters much easier and faster. Using the dungeon finder on World of Warcraft is fairly simple. Just start by clicking the “Looking for group” button at the bottom of your interface. A dialogue box will pop up that asks you if you want to queue for a random dungeon. There’s also a drop-down box in the upper right hand corner of that dialogue box that will allow you to select specific dungeons if you prefer. Always choose a random dungeon unless you have dungeon quests for a specific dungeon you can’t seem to pull in the random dungeon finder. Random dungeons give you a bonus item at the end of them, and, while this item may not always help you, you can certainly sell it to a vendor to get some gold or disenchant it if you are an enchanter. Every time you are dungeon leveling, you will probably wonder what the loot rules are. Many people complain about ninja looters, which are players who click “need” on an item they don’t really need. However, sometimes the complaints about ninja looters do go too far, with some players complaining when someone does actually need something and clicks “need.” The bottom line is, don’t let the other players bully you into needing on something you actually need, whether it’s for a profession or if it’s a piece of gear. If you need the item, then click “need.” Of course if you’re not a jewel crafter, then you should resist the urge to need on gems, but just don’t let people make you feel bad about needing things you actually need. The dungeon finder system is relatively new, but there is already at least one good dungeon leveling guide on the market to help you figure it out. A good dungeon leveling guide like Dugi’s Dungeon Leveling Guide can help you manage your time more efficiently. A dungeon leveling guide should direct you to the dungeon quests that can be done inside the dungeons that are available for your character’s level. In particular, Dugi’s Dungeon Leveling guide even includes maps for the lower level dungeons, which are a great help because Blizzard never included maps for them in the original game. A dungeon leveling guide will help you stay on track as you level faster than you ever did before.